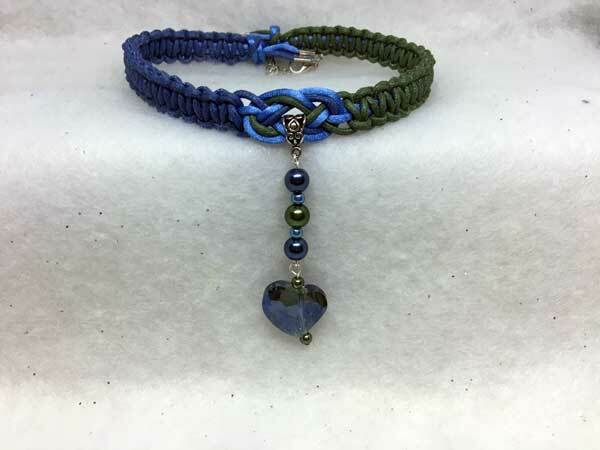 This piece is made using waxed cord along with satinique cord. The length can vary from about 17 to 20 inches with a center jeweled piece that adds almost 3 inches. It is done in dark sage, sky blue and denim blue. The jeweled piece consists of large sage and denim blue pearl rounds separated by small sky-blue pearl rounds. Hanging from that is a beautiful, faceted, opalescent, blue, puffed glass heart. surrounded by small dark sage pearl rounds.